Elivia Melodey’s Crystal Vibrations Music has evolved since the first singing crystal bowl arrived in Elivia’s life. Others soon joined that first crystal bowl, and their sacred celestial music became popular as they resonated throughout church services and gatherings around the San Diego area. 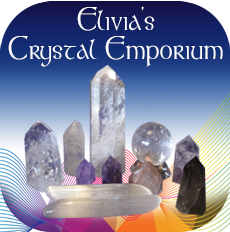 Now Elivia’s Crystal Vibrations Music holds concerts nationwide. Her instruments include over 45 singing crystal bowls, Celtic Harp, Symphony Gong, Hung, Hang, Buffalo, and Tung drum, Imbarimba, Freenotes, Balafon as well as chimes and ethnic percussion. 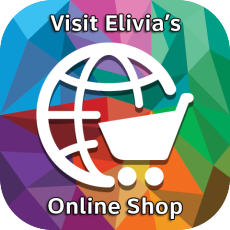 As a musical intuitive, each of Elivia’s concerts is unique and is created for that event, time, and space. 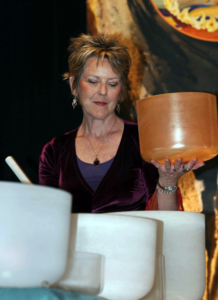 She has presented her healing music singing crystal bowl concerts for churches of many denominations, for organizations, schools, hospitals, and hospice centers, at conferences, expos, 5-star destination spas and resorts, for celebrations, weddings and rituals, as well as for a vast variety of wellness and healing centers. Crystal Vibrations Music was officially established in December of 2000 in conjunction with the recording and release of the first compact disk called, Celestial Memories. This music production was quickly followed by the release of three more compact disks, Journey to Wholeness(2002), and Crystal Portal (2004), and Terra Firma (2006). I know words like 'powerful' and 'sacred' are over-used, but, I am not often strongly affected by things. It's difficult for me to be articulate about this experience, but this sound can elevate the vibration of the entire group with ease into oneness with All That Is. The music you channel feels very sacred and seems to continue to resonate in my ethereal body for a long time. Your music was so peaceful and helped clear out any negativity while balancing my chakras. It was a pleasure and a joy to attend your Lake Havasu City concert. I felt "things were done" within me that night and the next morning I was able to "let go" of a relationship that was hurting me. Now, early this (two days after attending your concert) a.m. I was able to write to my mother helping her to see that my relationship with my oldest sister is too painful to continue. Wow! That was a lot of change for me! I attended Elivia’s concert at the California Massage & Bodywork Convention in San Francisco. The music was very soothing. Now, I use her CD’s during my massage sessions and have received positive feedback from it. Thank you for introducing me to the Crystal Healing Bowls. It definitely does wonders!